The property market in Indonesia started gaining momentum in late 1980s with surge of projects and customers lining up to have affordable houses with upscale facilities. Duta Pertiwi has only started building residences in 1988, but soon after, the young company boosted the industry with projects like apartments, shopping centers, office buildings, even township and industrial estates with level of creativity and innovation that was unheard before. 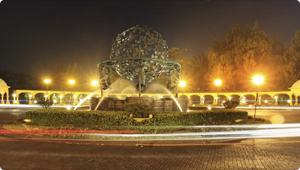 The vision gave birth to the iconic Bumi Serpong Damai, started in 1989 and now known to be Indonesia's most successful city and township project. From a derelict land, BSD now listed as the property company with highest market valuation in Indonesia Stock Exchange. Some principle applies to the development of ITC (International Trade Center) Mangga Dua, a formula to benefit from strata title sales opportunities for retail business space, also in 1989. From one spot in a busy trade district Jakarta, the ITC idea has flourished to practically every corner of major cities Indonesia. Duta Pertiwi went ahead with another success property recipe of combining condominium, retail space and offices into a mix superblock. Duta Pertiwi and BSD later developed under the wing of Sinar Mas Land, which now nurtures over 40 mega projects thoughout Indonesia. The sheer ambition to pioneer, build and advance, has given Sinar Mas Land the advantage to keep its pace as the front runner of the industry. However, its ability to sustain creativity and innovation is the real indication that Sinar Mas Land will ensure its vision for the future. 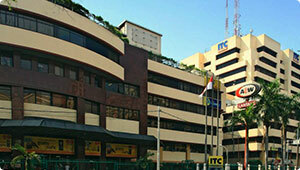 In 1989, the ITC Mangga Dua project began its development. Hailed as one of the first one-stop-shopping solution for the Jakartans, it has since grew into a 5 storey shopping center with more than 3500 shops to choose from to satisfy your chic fashion needs, electronics, hardware and even wet your culinary taste buds. 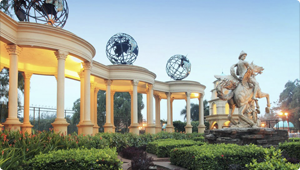 Originally passed as a satellite city in 1984, Sinar Mas Land started development in 1989. Dubbed as BSD City, it has grown to half the size of Paris and listed as a property company with the highest market valuation in the Indonesian Stocks Exchange. During the commemoration of Jakarta's 464th anniversary, a competition was held and one of Sinar Mas Land's project, Plaza BII (now Sinar Mas Plaza) won the Best Non Government Office's Garden. 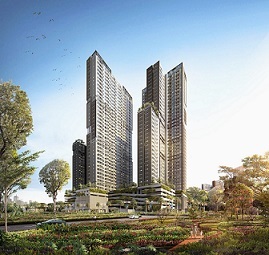 Awarded by the Jakarta Province Government, it was truly a milestone moment for Sinar Mas Land. 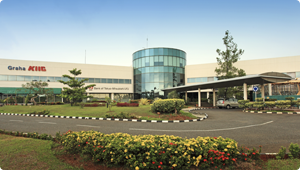 KIIC is a green yet modern industrial estate located in west Karawang, south of Jakarta and It is a joint venture between Sinar Mas Land and ITOCHU Corporation Japan. It encompasses an area of 1200 hectares and contains variety of national and multinational corporations such as Toyota Motor Manufacturing Indonesia, HM Sampoerna, Yamaha Motor Manufacturing Indonesia, Astra Daihatsu Motor, Panasonic Semiconductor Indonesia and Sharp Semiconductor Indonesia. KIIC is the first industrial estate in Indonesia to be granted ISO 9001:2000 certificate, ISO 14001:2004 for Quality & Environmental Management System in 2002 and certificate of OHSAS 18002:2007 for Health & Safety Management Systems. The Board of Directors of Sinarmas Land Limited announced that PT Bumi Serpong Damai Tbk and PT Duta Pertiwi Tbk have released their respective unaudited consolidated financial statements for the period ended 30 September 2013. 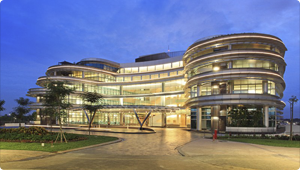 Bumi Serpong Damai and Duta Pertiwi are both subsidiaries of the company, listed on the Indonesia Stock Exchange. 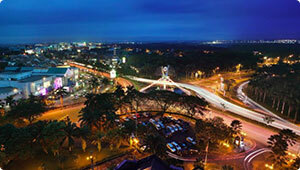 Kota Wisata, an idyllic urban getaway with an ideal blend of metropolitan sophistication and sweeping landscapes. It was conceptualized to provide harmony in living, learning,recreation and sports. It is an exclusive housing project located in Cibubur with an area of 480 hectares. The location is easily accessible from the Cibubur toll or from Bekasi. The development is away from the urban hustle and bustle, yet close to all the amenities and facilities a family could ask for. It is destined to be a vibrant and friendly community. The character and the identity of this project are personified in the projects bold slogan, 'The Natural Gateway to Excitement'. It offers a solution to people with active lifestyle. At Grand Wisata one can find an ideal spot for relaxation and an escape from the frenzy of city living. 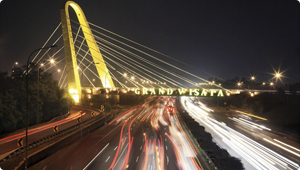 Driving along the toll road to east of Jakarta, one cannot help but notice the yellow suspension bridge that marks the main entrance to Grand Wisata. To emphasize its focus on nature and people, Grand Wisata created a development that embraced a sense of community that includes security, integrated transportation and utility services and accessibility to public facilities. 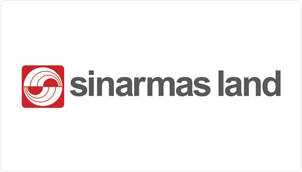 Sinar Mas Land is a property arm of Sinar Mas Group that comprised of two well-respected listed property companies: PT Bumi Serpong Damai, Tbk and PT Duta Pertiwi, Tbk. Sinar Mas Land Ltd. invests in, develops and manages real estate. The company owns commercial buildings, hotels and resorts in China, Indonesia, Malaysia and Singapore.